Rock solid strategies, tactics, tips and advice on all executive communication and public speaking topics including speechmaking, presentations, media interviews, TED Talks, storytelling, panel discussions, stage fright, introducing speakers, holiday speeches, making toasts, using PowerPoint, using Prezi, crisis communication and other topics. Great advice for anyone seeking to become a stronger, more confident speaker. Ladies and Gentlemen, Please Welcome….Me! When I first started speaking in public, I had a rather lofty image of how each engagement would begin: I’d be summoned to the stage with thunderous applause as a beaming host detailed the many reasons I was perfectly qualified to be the day’s expert. Screeeeeeeeech. That's the record player scratching as reality sets in. As well-meaning as hosts typically are, more often than not, they fall woefully short in priming the audience for their guest speaker. If left to their own devices, most hosts will print your bio off your website and read it verbatim, boring the audience with too much unrelated detail and never mentioning information that’s actually relevant. Not only does this kick things off in an underwhelming fashion, it deprives the audience of context they need to get the full benefit of your remarks. Worst of all, it can throw you off balance during one of your most critical moments: your open. Well before your talk, take a few moments to write your own brief (brief is key) introduction, customized for the speech you are giving and the group to which you’re giving it. Don’t wait to be asked, but rather email the introduction to your host ahead of time, indicating that in the past, hosts have found it helpful to have introductory remarks prepared for them. Just to be safe, on the day of the event, bring with you three copies of your introduction, printed in at least 20 point font so that anyone can read it well, even on the first pass. Next go into a short version of your intro that offers just enough info to give you the credibility you need. Though not ideal, this should allow you to keep your remarks mostly intact, while earning extra points for style under pressure. Give it a try and let us know how it works or what else might work better. For more great ideas and tips for rock solid communication, check out our blog “Let’s Be Clear," visit us at bluestoneexec.com, like us on Facebook or follow us on Twitter @bluestoneexec. Just as one pilot supports another during a dangerous mission, your Wingman can protect you from distractions. Strong speakers know an important element of a great speech or presentation is focus. Speakers who can block out distractions and zero in on the audience are more likely to be engaging, interesting and effective. And yet, more often than not it seems there’s a concerted campaign underway to distract the speaker from the moment he or she arrives at the venue. The host wants to clarify something about the introduction. A guest is clamoring to point out a mutual acquaintance. The AV tech has questions about technical needs. On top of it all, there are legitimate business leads that deserve attention. How can a speaker possibly concentrate and make final preparations when there are so many other demands for attention? No matter the size, formality or venue of an event, if it’s a performance that matters, the Wingman is the answer. A Wingman can be male or female. Your Wingman might be a colleague, might be an intern, or in some cases, might even be your boss. But in this role, the Wingman’s number one job is to manage logistics, shield you from distractions and do whatever it takes to make you look good. Before your talk: The Wingman can help you get to the location on time and looking your best, set up and run your technology, run interference with clingy members of the audience, and work the room for leads while you focus on your impending remarks. During your talk: The Wingman can take photos of you speaking, solve unexpected technical problems (or enlist someone who can), quash distractions like a vacuum in the hallway, and if necessary get the ball rolling with Q and A. After your talk: The Wingman can help you engage important leads, shield you from less important contacts, and pack up your materials while you’re basking in the glory of a great speech. Maybe most importantly, the Wingman can later can provide you with feedback so you can be even more effective next time. How you use your Wingman is up to you. The only requirement of the job is that he or she can put you at ease and help you look great when it’s your turn to shine. Give it a try and let us know if it works for you or what else has worked better. For more great ideas and tips for rock solid communication, like us on Facebook or follow us on Twitter @bluestoneexec. It’s possible to READ a speech and still have impact. The trick is making eye contact at just the right times. 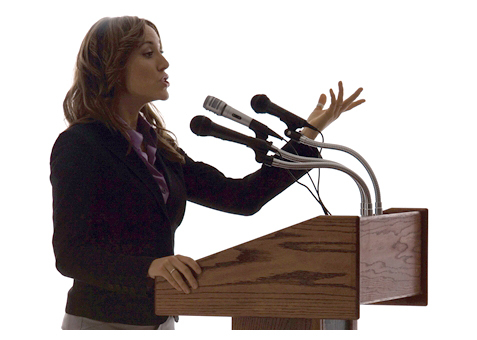 We all know that when delivering a speech it’s always best to learn the material cold and deliver it from the heart. But let’s face it: For busy executives with frequent trips to the podium and little time to prepare, that’s not always an option. If you must read a speech, make it infinitely more impactful by looking up NOT in the middle of each sentence, but rather at the beginning and, more importantly, the end. That’s it. Sounds simple enough, yet it’s actually counter-intuitive and requires practice to pull off. But for anyone who doesn’t have time to internalize a speech or simply can’t, mastering this technique for reading remarks is the next best thing. In normal conversation, we typically stack the most important words at the ends of sentences and when we speak them, if it’s important, that’s when we’re sure to make eye contact. But somehow when we put ourselves behind a podium, that natural inclination gets flipped and our delivery comes out exactly opposite, depleting our words of impact and making us appear disconnected or insincere. Maybe worse, if we read the way most people are inclined, no matter how great our speechwriter is, we’ll squander every good line by breaking eye contact at exactly the wrong time. (Eyes back down) but by the content of their character. The impact of the sentence is almost completely lost when we drop our eyes while delivering those critical last few words. (Eyes back up) but by the content of their character. What a difference! We’ve made a connection at both the start of the thought and at its inspirational end. It’s as if that sentence takes on all new meaning! And we can pull this off without memorizing the speech. We simply use the least important part of the sentence—the middle—as an opportunity to glance down, catch our place and gather up the words that will drive our point home. Though making this adjustment requires practice, the effort is worthwhile. After all, connect with the audience and we’ll win their hearts, we’ll spread our message and who knows? We may even change the world. Give it a try and let us know how it works or what else might work better. For more great ideas and tips for rock solid communication, check out our blog "Let's Be Clear," visit bluestoneexec.com, like us on Facebook or follow us on Twitter @bluestoneexec. A few months ago I attended a professional event at which I knew a well-respected and charismatic CEO would be speaking. Sure enough, he started things off with the stage presence of a stand up comedian and quickly had us all laughing and leaning in. But then it started: The dreaded PowerPoint presentation. Rock solid media training, speech coaching and presentation coaching to prepare executives to communicate with impact in high-stakes situations, including presentations, media interviews, Board meetings, and employee town hall meetings. We specialize in media training, speech and presentation coaching, transition communication and crisis communications. Based outside Detroit, Michigan; we work with clients in Chicago, New York, LA, Boston, Toronto, Atlanta, Orlando and wherever our they need us across the globe. A Bluestone Special Event: "Outclass the Competition" June 5, 2017 at 6:00 p.m.